Bang, bang! 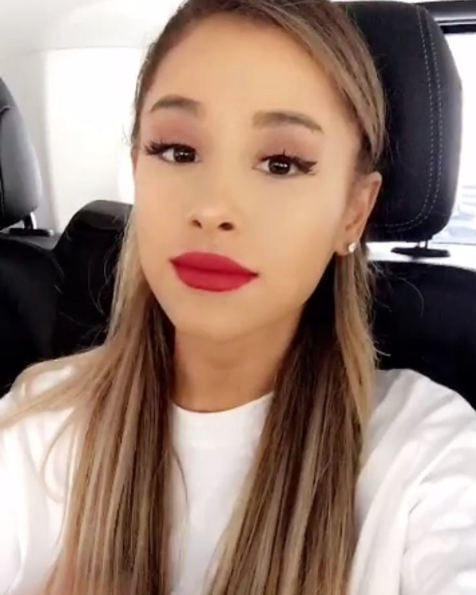 Ariana Grande debuted a refreshing new look in three Instagram selfies posted on Saturday, July 23. The “Into You” singer, 23, showed off brow-skimming bangs that complemented her signature high ponytail, streaked with blonde and brunette locks. While she didn’t include a caption, she tagged the man responsible: celebrity hairstylist Aaron Light. “✂️ #BANGBANG ✂️,” he wrote, regramming her selfie. And wouldn&apos;t you know, the bangs are actually Grande&apos;s hair, not clip-ons. Light, who also works with America Ferrera and Emily Bett Rickards, tells Us Weekly that the singer was in search of a change. "She was looking for something fresh and new. To me, bangs were the next evolution to her iconic look," Light tells Us. "I did a modern take on a &apos;60s bang. However, the key to this cut is that I tailored the shape of them to match the shape of her face. [The final look] is so versatile. It will look great with her signature pony, but would also look fantastic with her hair down." Grande’s bangs arrive on the heels of another summer hair makeover that she revealed on July 6. She dyed her hair blonde while taking a break from her Dangerous Woman tour. She kept the top of her mane dark, and added an ombre effect to her tips. But Grande’s cut and color nearly pales in comparison to when she wears her hair loose. For the “Into You” video, which debuted on May 24, she ditched her ponytail and wore her locks in loose waves. Grande rarely leaves home without her updo, citing damaged hair as the reason. "I had to bleach my hair and dye it red every other week for the first four years of playing Cat," she Instagrammed in January 2014, making reference to her Nickelodeon sitcoms, Victorious and Sam & Cat. "I wear extensions but I wear it in a ponytail because my actual hair is so broken that it looks absolutely ratchet and absurd when I let it down." Grande’s keeping her head up after the news that she was barred from a White House function surfaced on Friday, July 22. According to Wikileaks’ Democratic National Committee emails, the singer wasn’t considered because of Donutgate.